This book is currently out of print, but still available on Amazon. It is well worth the hunt to find it. The story tells of a little boy who is invited to dine with artist Rene' Magritte and Salvador Dali. The illustrations include several references to both artist's work and are very whimsical. This is a great indroduction to Surrealism for young children. The paintings of Jacob Lawrence serve as a backdrop to this story which introduces the acclaimed artist. The following two book are by author Peter H. Reynolds. 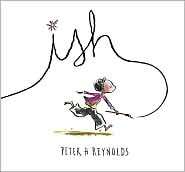 Video of Peter Reynolds speaking about his work. 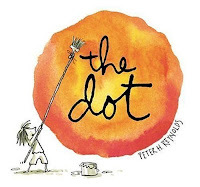 The Dot is a story about a little girl named Vashti, who is convinced she cannot draw. Her teacher encourages her to just "make a mark" and then then fawns over the dot Vashti makes. This encourages the young girl, who sets off to create more masterpieces. When Ramon discovers that his younger sister has secretly saved his crumpled artwork, he tells her that the work is not good, but she tells him it looks "vase-ish". With this perspective, Ramon is encouraged to create even more "ish" works of art. Guide for using The Dot and ish in class. Merchandise featuring The Dot, including t-shirts. 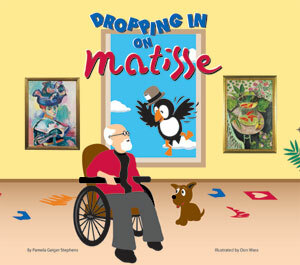 This series, by Pam Stephens, follows a puffin named Puffer as he travels to interview various famous artists. 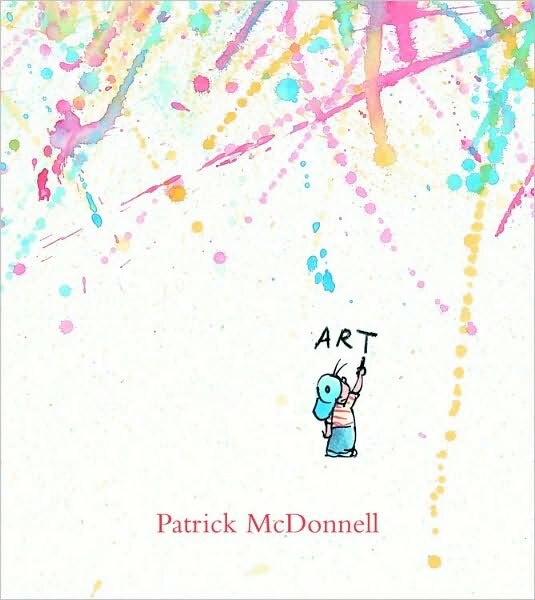 The artist's works of art are used within the books. I actually use the videos with my class and the kids are mesmerized by them! The author cleverly uses comedy and cartoon like drawings interspersed within the story to keep the listener's attention. 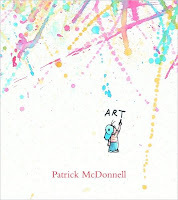 There are tons of books on nearly every well known artist. Some books have been made into videos. A peek at one of the videos. While on a field trip in France, a young girl discovers a real life caveman who tells her of the ancient paintings and his life. 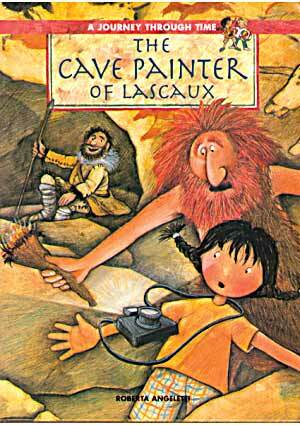 This is a great introduction for young children to cave painting art. Sneek peek video of the book. This series of books is the BEST artist biographies I have found. They are imaginative, to the point, and are not too difficult for students to understand. Believe me, I have bought several biographies and these are the best! 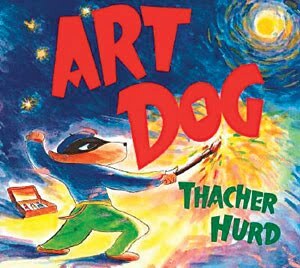 Guard at the museum by day, artist by night, Art Dog also finds time to apprehend a band of thieves who have stolen the Mona Woofa from the museum. 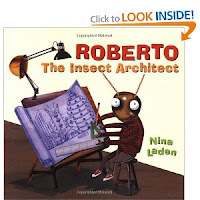 Great story with vivid illustrations. The collages in this book are beyond amazing, which makes the story even more rich. 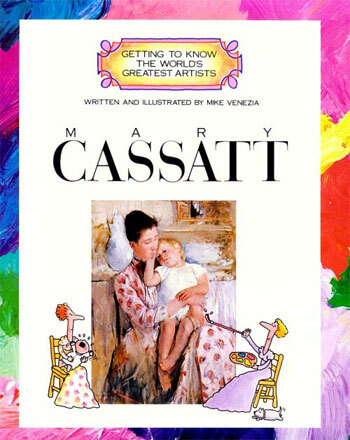 It is based loosely on the life story of artist Marc Chagall and includes referneces to his work. 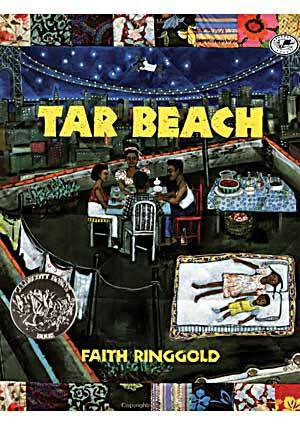 Tar Beach tells the story of Cassie Lightfoot as she lays upon her roof, which she calls "tar beach". Cassie dreams of flying over her favorite landmarks and owning them. 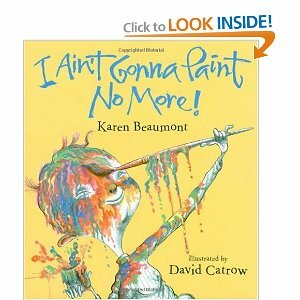 This book will inspire many art projects with its beautiful illustrations. 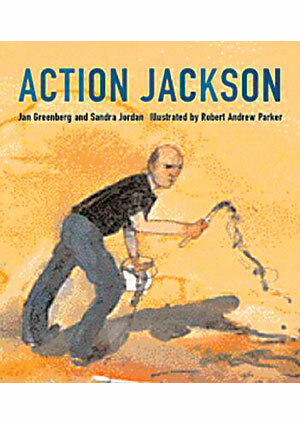 There is a great site which has various actors reading books and this book is on that site. You can find it here. 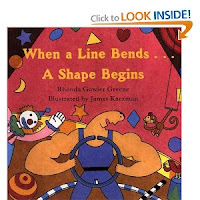 Various shapes are introduced in this colorful book. 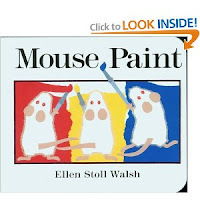 The illustrations are very cute and make this book ideal to use with kinders. Teaching ideas from the author. A peek inside the book. 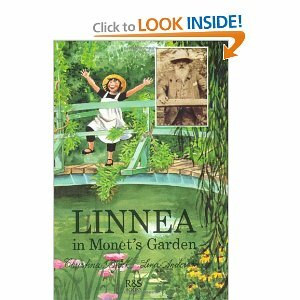 Linnea befriends her elderly neighbor Mr, Bloom, who educates her on the life and art of Claude Monet. They decide to travel to France to see the actual gardens of Monet. I use the video with my first graders and they LOVE, LOVE it. The video includes footage of Monet's garden and the infamous Japanese bridge. I HIGHLY recommend the video. Buy a Linnea doll or mini suitcase. When James' mom gets close to delivering the new babies, she sends James to visit his artist uncle Romare Bearden in New Your City. 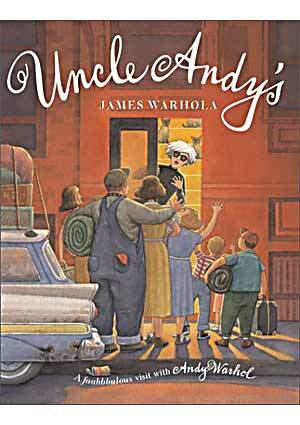 James learns a lot about his uncle's life as an artist and learns a new way of creating his own art. I simply love the books by Anholt. They tell a story of the people around the artist while telling about the artist himself. 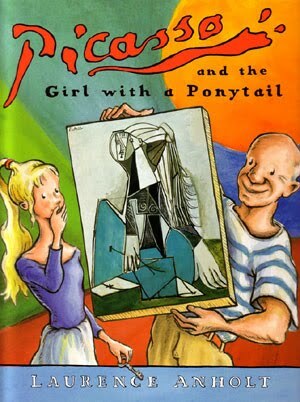 In The Girl With A Ponytail, we meet Sylvette, who becomes Picasso's model and develops her own artistic style. The Anholts have an awesome website also. This book creates a mood from the beginning. 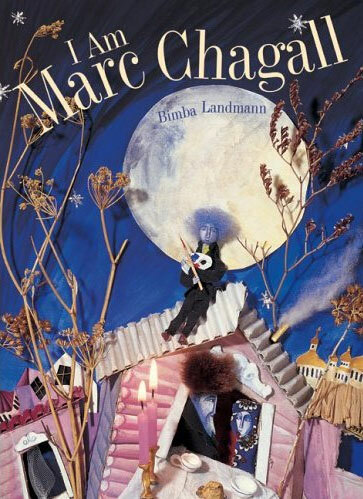 The deep blues and purples used in the illustrations draw you in immediately. 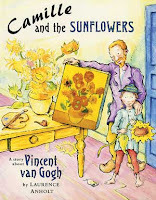 The story of Vincent vanGogh and his starry night is told through the eyes of a young boy. 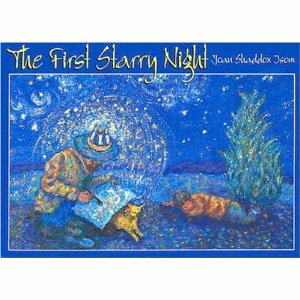 Cool video of vanGogh paintings set to the song "Starry Starry Night"
The artist Jackson Pollack is introduced in this short story. If you haven't tried this site for making your own Pollack masterpieces, you really must! 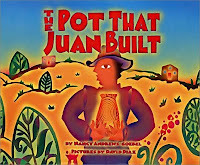 Using the format of "The House That Jack Built", this book tells the story of Juan, a potter from Mexico. The book has a unique format, in that it has the poem form of the story on the left, and the narrative form on the right. 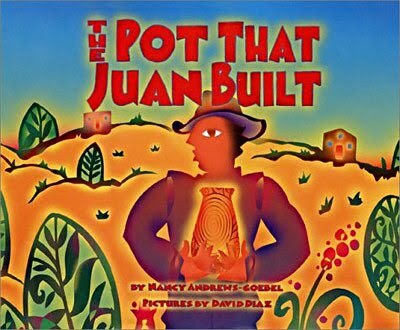 Based on the life of artist Juan Quezada, this book is a great introduction to his pottery and the Mexican culture it arises from. 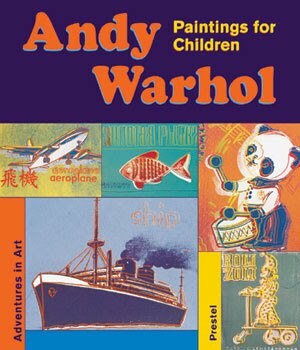 Written and illustrated by Andy Warhol's nephew, this book allows us a glimpse into the artist's personal life and creative process. The illustrations are wonderful and comical! The youngster in this book takes pleasure in painting various parts of his body until his mom finds him and throws him in the bath. Cute story! Camille befriends the odd new artist in town and learns a lesson in tolerance and loyalty. VanGogh's artwork is used within the drawn pages also. 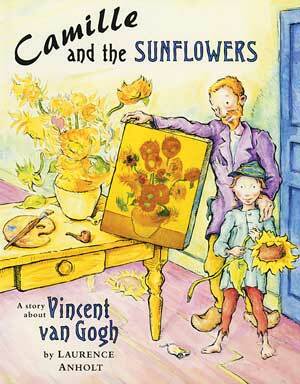 I use this book as a starting point for our chalk sunflower drawings. Website of Laurence and Catherine Anholt- Cool interactive site! Laurence Anholt reads the story to you here! Another favorite book of mine! 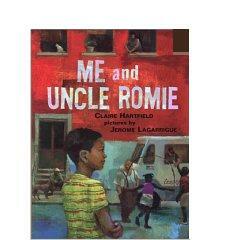 I simply adore the mixed media artwork in this book and it inspired our Neighborhood project. Roberto is a termite who is supposed to destroy the very architecture he loves. His journey is sweet and fulfilling. There is a movie version of the book available. Website of author Nina Laden. A cute story of a boy who wants to spread his creative wings, but is nearly stifled by an overbearing teacher. 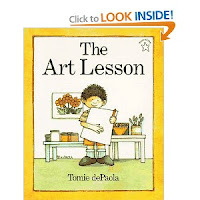 This book is an essential for any elementary art program. 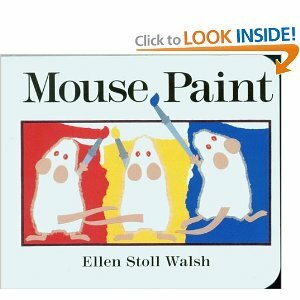 The mice mix the secondary colors by crawling in and out of paint jars and mixing it with their feet. Project using the book as an inspiration- includes handouts. Art loves Art. He draws and doodles all day long. 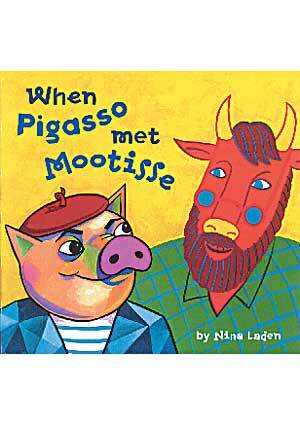 A really cute and sweet story for younger kids. You have all of my favorites and some I'm eager to include in my list of favorites. The first on the list is so timely. I was just about to plan a lesson on surrealism for my homeschooled kids. Do you have a single list of these titles??? Could I have it if you do? I want to e-mail it to the librarian. Thanks! 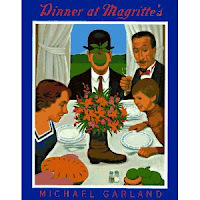 Dinner at Magritte's is my all-time favorite book to use in the classroom. The kids LOVE it and really "get" the surrealism. Glad others have found it too! You mentioned Uncle Andy's - there is now another book (same author - Warhol's nephew) specifically about Warhol'scats - I think it may be just called Uncle Andy's Cats and is very much in the same spirit. I'll have to post a nice lesson I did on Andy's cats earlier this year. 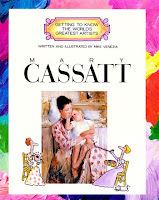 Your blog is fabulous....and this list is outstanding.....I am a homeschooler and we are doing an ongoing artists study...I love using the picture books to get them hooked and to keep my littlest one involved....so wonderful....thank you! Just found your blog because you found mine1 Love all the books - can't wait to add them to my list! Thanks for this list. I am going to link it to my blog! Its fantastic. Exactly what I was looking for. Another one I would put on your list is Leon the Chameleon by Melanie Watt. Perfect for complementary colours. Uncle Andy's Cats is a favourite of mine. The kids drew the best ever cats in the same style as Andy. they were awesome. LOVE this! 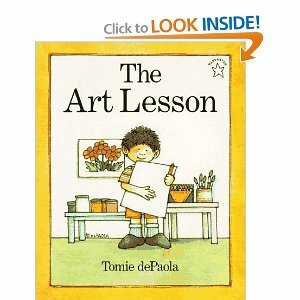 I have some money from Artsonia sales that I want to use to buy new art books for my classroom with. Thanks for the suggestions! Just as I told Patty (DSS) I use books so often and LOVE to see what others are using. I have used several of these books, but the new titles to use make me so happy!! Peter H. Reynolds books are amazing! I love (and have) them all! I agree that Anholt books are AWESOME! Thank you for taking the time to share this! the Smart About Art artist bio series. This list is so helpful! 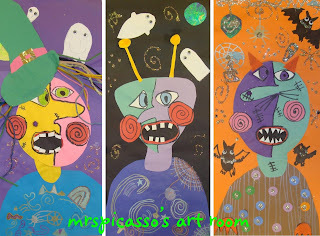 I have been a high school teacher for 20 years and have recently started also teaching elementary art in our district. Every resource helps! Thanks so much for this wonderful list!!!!!! I have been a high school teacher for 20 years and just recently began teaching at the elementary level as well. Every resource helps and I appreciate all the time you took putting this list together. Thanks so much!!!!! Ms. Jones, I was recently laid-off from my 10 year high school teaching position. Tomorrow I begin teaching elementary. I am terrified. What were some of the most important things you encoutered in your transition?